Reposted with permission from post here. Last weekend I was honored to join more than 5,000 citizen activists in the Tar Sands Resistance March from the Mississippi River to the Minnesota State Capitol in St. Paul to protest the expansion of the Alberta Clipper tar sands pipeline and other fossil fuel projects that are threatening the Midwest. The march, co-sponsored by the Sierra Club, was the largest anti-tar sands event ever in the region. 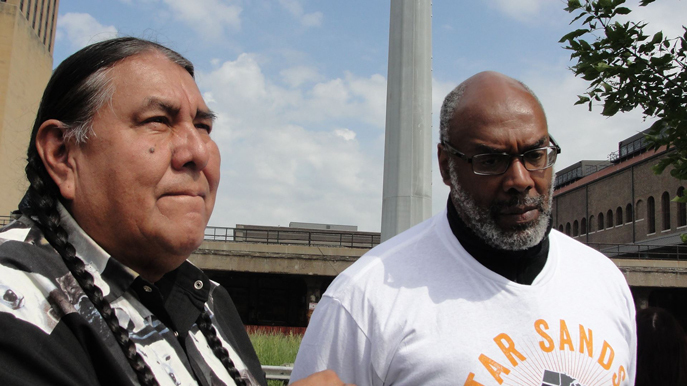 Headed up by many indigenous leaders, including Tom Goldtooth of the Indigenous Environmental Network and Winona LaDuke of Honor the Earth, the march was a moving demonstration of the diversity of the growing anti-tar sands movement in the Midwest. We were also joined by U.S. Representative Keith Ellison, Bill McKibben of 350.org, the Reverend Lennox Yearwood of the Hip Hop Caucus, and many other inspirational leaders. You can view photos of the march here. 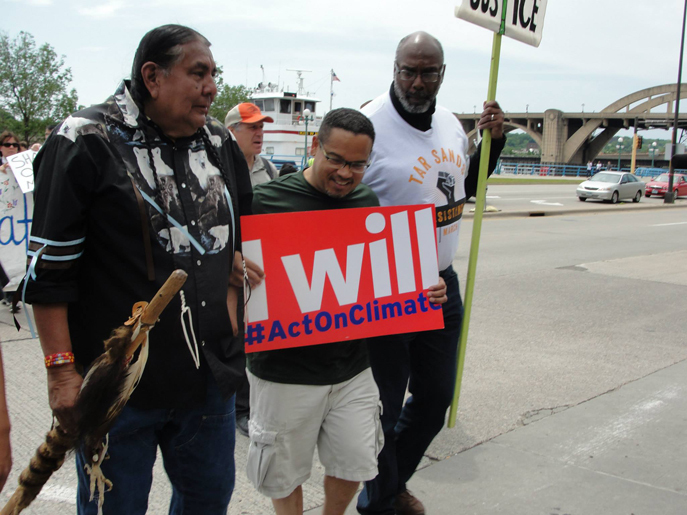 Tom Goldtooth, Keith Ellison, and Aaron Mair at the Tar Sands Resistance March. We are seeing old evils like racism, cultural injustice, and the subordination of sub-national groups like Native Americans being stripped once again of their sovereign national rights as defined by treaties — this time in the name of the urgent false call for energy independence being touted by the carbon industry. Regrettably, the “call for independence” is an intellectually dishonest play on our patriotic past that was also an era of forked-tongue dishonesty and tragedy that witnessed the extermination and dislocation of whole populations so that the land and natural resources they once held could be stripped away. Fast forward to the 21st century and we are now seeing this ugly tragedy repeat itself. This time, however, the First Nations and all races and communities have come together to expose this cynical effort to deny sovereign indigenous people of their treaty rights, and deny humanity a carbon-free future. Tom Goldtooth and Aaron Mair. The thousands of citizens from across America who descended on St. Paul for the Tar Sands Resistance March were a clear demonstration of our diverse nation coming together to protest the construction of new pipelines and other infrastructure projects which will deliver only harmful impacts for the planet and irreparable destruction to the region, not the jobs and energy security promised by big oil companies and their political backers. We should be moved by the dozens of groups, including national and local environmental organizations, indigenous communities, and social justice and civil rights groups, who all agree it will take a unified front of humanity to fight back against the pipeline companies and fossil fuel interests. It’s great to be here in Minnesota and to look out at all these amazing faces: young and old; black, white, and brown; and from all walks of life. The movement that began last year with hundreds of thousands of people marching on the streets of New York City is spreading across the nation, and we cannot be ignored. Together we are telling President Obama that we don’t want or need — and indeed we can’t afford — dirty fuels, starting with the tar sands, the most dirty form of oil there is. The United States needs to lead a worldwide effort to speed up the 21st century’s complete transformation to clean energy, which will bring prosperity to many, and not cede the control of our nation to a handful of oil company executives and dirty polluters. The U.S. must lead by example and take definitive steps to keep dirty fuels like coal, fracked gas, and tar sands crude in the ground — like saying no to the Keystone XL pipeline and other dangerous tar sands projects. Climate disruption, after all, presents us with an obligation and an opportunity. Dramatically cutting emissions from dirty fossil fuel power plants fulfills our obligation to turn the tide on climate disruption and the extreme weather it is already fueling. Innovative clean energy technology offers a very rare historic opportunity for the United States to create a safer, healthier, more prosperous, equitable, just, and rewarding standard of living — and to lead the world toward this universally beneficial goal. And that’s why we’re here today in Twin Cities. It’s time to address the climate crisis head-on by endorsing the clean energy solution that is already at hand — that is already working. If we’re going to change everything about the way our country works — which is exactly what we need to do — we’re going to need everyone. It’s a big job, but it’s not impossible. We’re already gaining steam. And by joining together here, and everywhere there is injustice, we will prevail. Aaron Mair of Schenectady, New York, is the president of the Sierra Club’s board of directors. An epidemiological-spatial analyst with the New York State Department of Health, Mair’s experience includes more than three decades of environmental activism and over 25 years as a Sierra Club volunteer leader, where he has worked diligently for environmental justice.